Specimen collection number SCL 15254 in the UBC Herbarium Algae Database. Search the collection number in the database for more information on this specimen, or search the species for further occurrences. Images courtesy of Sandra Lindstrom. Serrulated surfgrass is a perennial aquatic plant (a seagrass, rather than a seaweed). Its long and narrow leaves have distinctively toothed margins and five or seven veins running along their lengths. The serrations can be felt when the leaf edges are stroked. The leaves grow to 1 m long and less than 1 cm wide. Tufts of leaves are attached to a substrate by rhizomes, and each rhizome node has a pair of roots. The inflorescence is a 5-40 cm long stalked spike. There is usually one spike per stem; stems are annual. ​Serrulated surfgrass forms beds on rock in the mid to low intertidal along exposed coastlines. While it does not grow in soft substrates, its roots often trap sediments. Its range extends from the south end of the Alaska Peninsula to central Oregon. Serrulated surfgrass and Scouler's surfgrass (Phyllospadix scouleri) were once considered a single species. The leaves of the latter usually have three veins, can grow to 2 m long but are a bit thinner (5 mm wide versus 8 mm), and has 6-10 roots per rhizome node. It also occurs lower in the intertidal. Torrey's surfgrass (P. torreyi) has much narrower leaves (1.5 mm wide) and branched stems. 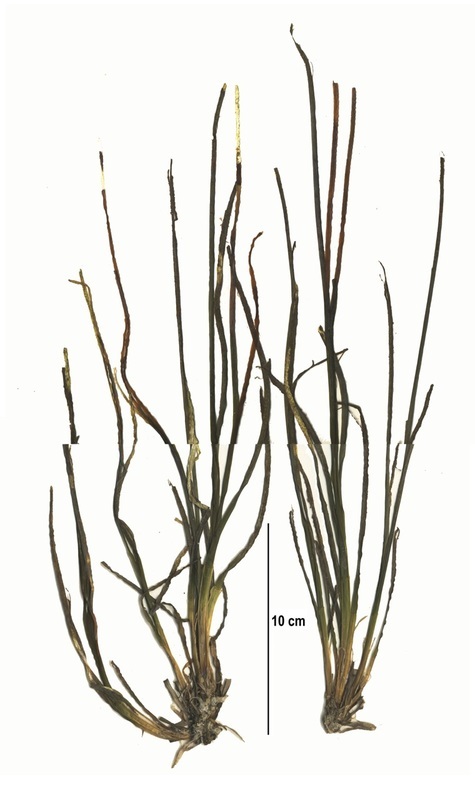 Eelgrass (Zostera marina) usually grows in mud, sand, or gravel (or mixed) in more sheltered locations. Both Torrey's surfgrass and eelgrass lack serrated leaf margins. Surfgrasses are extremely productive primary producers and provide habitat for many invertebrate and algae species, as well as nursery habitat for fish. They also play important roles in clarifying water, settling suspended sediment, and preventing erosion. Phyllospadix species are sensitive to water contamination from sewage and oil, and are slow to regenerate if the rhizome is destroyed. They are also sensitive to desiccation during low tide at midday. Click here to learn more about these plants. Lindberg, M. and Lindstrom, S. (2010). Phyllospadix scouleri Scouler's Surfgrass. Seaweeds of Alaska. Accessed 19/04/2016. Phyllospadix (Surfgrass). Pacific Rocky Intertidal Monitoring: Trends and Synthesis. Ecology and Evolutionary Biology, University of California Santa Cruz. Accessed 16/09/2013. Phyllospadix serrulatus Rupr. ex Asch. In Klinkenberg, Brian. (Ed.). E-Flora BC: Electronic Atlas of the Plants of British Columbia. Lab for Advanced Spatial Analysis, Department of Geography, University of British Columbia, Vancouver. Accessed 19/04/2016.